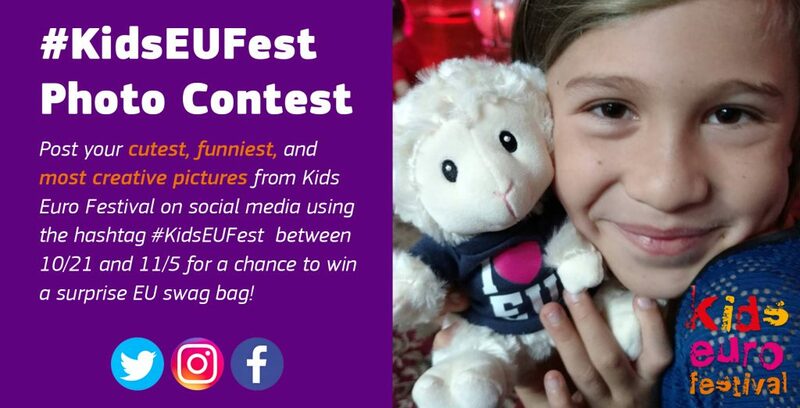 Post your cutest, funniest, and most creative pictures from Kids Euro Festival on social media using the hashtag #KidsEUFest on Facebook, Twitter, and Instagram between 10/21 and 11/5 for a chance to win a surprise EU swag bag! We’ll announce the winners of our 2017 #KidsEUFest photo contest on the Kids Euro Festival Facebook and Twitter pages. Multiple entries allowed – one entry per day per person. Post on multiple social media channels to increase your chances of winning! Tell a story. Share something interesting you learned about Europe at #KidsEUFest, tell us what your favorite event was and why, or how #KidsEUFest inspired you and your family. Photos with Bruno and Sofia get extra points!